History: Exoskeleton is Queen Chrysalis's faithful and loyal general. He earned his name due to his thick hard armored shell. Unlike other Changelings, Exoskeleton prefers to rely on his own strength in place of feeding off of love. He is a battle-hardened veteran who is loyal to his queen and loves the thrill of a good fight. Elite Fighter: One of Exoskeleton's most notable characteristics is his insatiable bloodlust and hunger for battle. Because fighting is his way of life, he continually strives to be stronger, and he considers himself indebted to Queen Chrysalis for allowing him to exceed his natural fighting limits. He is highly masterful with his sword and has used his skill to become somewhat of a savage brute, as the lack of true law in Queen Chrysalis's hive allowed him plenty of opportunities to engage in battle against foes that he saw as threats to the hive. He effortlessly wields his large sword with ease, taking advantage of it's power to maximize his attacks. He commonly uses brute strength to hack down an enemy's defense. Hard Shell Armor: Exoskeleton holds the self-proclaimed title of the strongest Shell of all Changelings (including the past and present hive members), allowing him to withstand almost any attack with no sign of injury. However, a strong enough opponent has found the necessary requirements to harm him from time to time after a brief trial-and-error duel using magic or enough of their own strength in order to cut through Exoskeleton's shell. This shows that while his shell armor is strong, all the opponent has to do in order to overcome it is "adapt" to its density with their own physical strength and/or magic. Enhanced Strength: Exoskeleton is frighteningly strong, and can put a lot of destructive power behind his large sword with devastating results. A sword: Exoskeleton carries a broad sword with a long wide blade as his choice of weapon for battle. 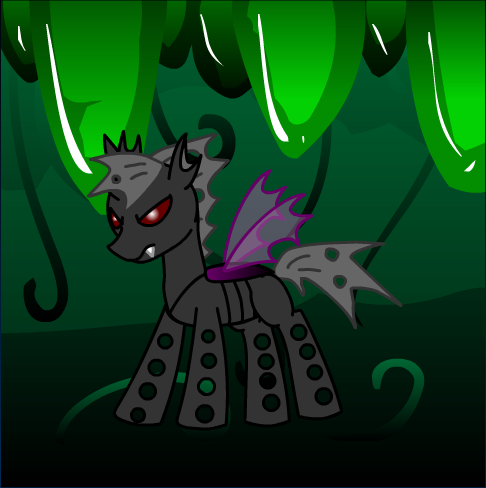 Overconfidence: Exoskeleton believes that he is the strongest fighter there is and that nopony can beat him. Ultimately making him ill-prepared for who or what he may face.